CHARLOTTE, NC – Toys & Co. in Cotswold Village Shops at 242 S. Sharon Amity Road is generously donating 20% of purchases made between February 20th – 26th to support the homeless children we serve with the programs of Bright Blessings. The 9,000-square-foot interactive toy store in South Charlotte offers more fun than a barrel of monkeys, so if you have never explored this toy mecca with your kids, you’re in for a treat! 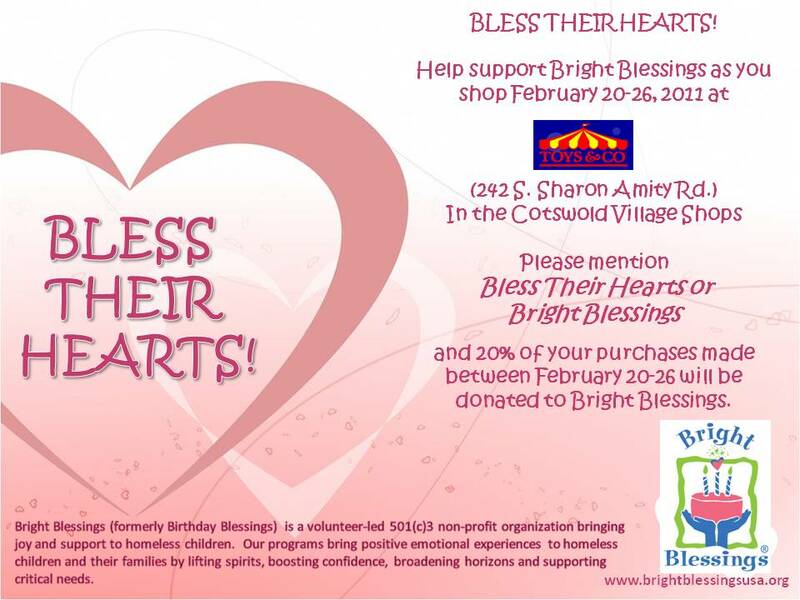 Be sure to mention Bless Their Hearts at Bright Blessings when you make your purchase. Thank you for your support!! Toys & Co. is a donation drop site and proud sponsor of Birthday Blessings, and offers a year-round 15% discount on items purchased and donated to Bright Blessings. Entry filed under: Bless Their Hearts, Donations. Tags: Toys & Co..
All About Baby – Charlotte – February 27th	Bright Blessings Welcomes Carly Behrmann as our Student Birthday Program Manager!